Baritone Quirijn de Lang (Sam Trouble in Tahiti and Count Almaviva The Marriage of Figaro) back in the role of Fred Graham / Petruchio. Soprano Stephanie Corley (Hanna Glawari The Merry Widow) as Lilli Vanessi / Kate. Actor and singer Zoë Rainey comes to the role of Lois Lane / Bianca following the success of An American in Paris at the Dominion. Dancer, singer and actor Alan Burkitt (Top Hat) returns as Bill Calhoun / Lucentio, having played the role during the Welsh National Opera run in 2016. 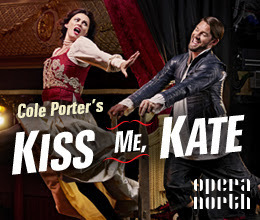 Opera North's production of Kiss Me, Kate is to transfer to London for a run at the Coliseum from June 20th-30th, 2018. It is the first time Opera North's production has been staged in the capital. The show will open Leeds Grand Theatre from May 23rd-26th, 2018, before transferring to the Coliseum which is the home of English National Opera, . Kiss Me, Kate has music and lyrics by Cole Porter and is about the production of musical version of Shakespeare's The Taming of the Shrew and the conflict between show runner Fred Graham, and his ex-wife and leading lady Lilli Vanessi.It features classic numbers including Another Op'nin' Another Show, Brush Up Your Shakespeare, Always True to You in My Fashion and Too Darn Hot. With a cast to be announced the production will be directed by Jo Davies, and feature the the full-scale orchestra and chorus of Opera North conducted by James Holmes, with choreography by Will Tuckett. It has set and costume design by Colin Richmond and lighting by Ben Cracknell.